I received the following comment from Debra Kahn and I thought it deserved attention. Check out Program Ammam Imman and the good work they are doing. Please tell your readers about Program Amman Imman, dedicated to improving and saving the lives of one of the poorest and most poor abandoned populations in the world who live in the Azawak of Niger. The Azawak is a vast region without infrastructure, and most importantly, inhabited by ethnic minorities with no access to water. The region is so vast that children have to travel as much as 35 miles a day to find water for their families and animals. Amman Imman has been established to change the situation for the people in this region, at their request, by building deep borehole wells, and also working with them to manage their water sources once they are built. The hope is that once two wells are completed larger organizations will find it safe enough to bring in their aid workers to build more wells. Program director Ariane Kirtley founded Amman Imman in 2006 after proposals to large humanitarian organizations to bring aid to the region were turned down due to the danger to aid workers working in such a vast region without water. This was a catch-22 and Ms. Kirtley could not turn her back. She endeavored to begin a pilot project to build two wells in the hopes of acting as a catalyst for other organizations to bring aid. This is an effort fueled by compassion, sensitivity and persistence. Ms. Kirtley took it upon herself to change what was not right even when others would not support her. As of today, Amman Imman has completed one borehole well in the Azawak. Once the first well became operational, the people immediately began to make bricks to build a school. Please find out more about Amman Imman’s work and long-term goals by visiting the website http://www.waterforniger.org/. Also, Ms. Kirtley’s work has attracted the attention of students from age three through the University level. Yale Unicef students are partnering with her. Montessori students around the world are collaborating to raise funds for Amman Imman. Please read about the student partnership with Amman Imman on the blog that has been set up to track their efforts: http://montessori-amman-imman-project.blogspot.com/. Thank you for taking the time to find out about the people living in the Azawak of Niger, and how Amman Imman is helping. 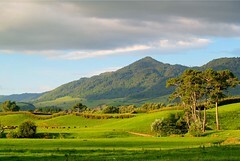 In October 1994 the government of New Zealand outlined in its Environment 2010 Strategy, nine environmental issue the country needs to address to be able to claim the status of a “clean green” country. Those issues include biodiversity, ozone, climate change, energy, fisheries, pests and weeds, pollution, land use and water use. Water issues New Zealand faces include contamination from agricultural stock, preserving high quality fresh costal waters, unsustainable land practices, and changing natural waterways through hydroelectric development. retaining sufficient water in water bodies to meet the community’s in-stream recreational and cultural needs, and ecological and other values. A sarcastic look at a possible future in Australia. Water a cure for disease? According to alternative health physician Dr. F. Batmaghelidj, not drinking enough water may be hurting your health. He believes water many be a natural cure for ailments such as arthritis, asthma, autoimmune diseases, back pain, diabetes, high cholesterol and migraines, among other diseases. Arthritis, for example, could be caused by chronic dehydration leading to a shortage of water in the joints. More information, including a series of books on the connection between water and proper health, can be found at Water Cure. If you live in the United States Scorecard provides a searchable database for Clean Water Act and watershed issues in your area. Enter your zipcode and find out the status of water in your area. According to the site the state I live in is in the second lowest 20% of states when it comes to clean water levels. Sounds pretty good. But my county has pollution levels higher than the national average, and has the second highest levels in the state! Now that I know my community’s status the site has a discussion board and links to contact the EPA about my concerns. Check out your community report card. You might be surprised at the results! Scorecard will also give you reports on many other local sources of pollution. This public protest addresses concerns over clean water in Ireland. Finding a balance between water needs and environmental protection is always difficult, but the challenge increases when a large population center is also plagued with drought. After a 30 year legal battle, environmentalists and government officials finally came to an agreement over water use in California’s East Bay and Sacramento County. Debate centered around a plan by the East Bay Municipal Utilities District to divert water from the American River to protect 1.2 million customers during times of drought. Instead it was agreed to use water from the Sacramento River, which will result in a lower environmental impact than taking water from the American. The compromise was reached after environmental groups and the EBMUD reached an agreement out-of-court, saving continued legal costs. Save the World in Three Easy Steps. 1. Learn. Read this blog to learn more about our global water crisis and how it impacts billions of people. 2. Make a Scarf. Follow our easy instructions to make a beautiful and unique scarf. Wear one to show your support for those in need, and sell a few to your family and friends. 3. Donate. Give the money you raised from your scarf to a worthy charity (See our list of Resources). Even a little bit will change the lives of those who have no access to clean water. Repeat until everyone has access to safe, clean water.